Germany's invasion of Denmark in 1940 stopped supplies of Danish products. The war-time need to repair and refit ships offered L&T an opportunity, and led to the formation of a new company, Hilda Ltd, to handle these operations. L&T also started to repair and fabricate ships signalling the expansion of the company. The sudden internment of German engineers in British India (due to suspicions caused by the Second World War), who were to put up a soda ash plant for the Tata's, gave L&T a chance to enter the field of installation. In 1944, ECC was incorporated by the partners; the company at this time was focused on construction projects (Presently, ECC is the construction division of L&T). L&T began several foreign collaborations. By 1945, the company represented British manufacturers of equipment used to manufacture products such as hydrogenated oils, biscuits, soaps and glass. L&T's amazing growth story has been possible because of the fresh talent that flows in from engineering campuses. We believe in transforming fresh graduate engineers into future leaders by making them go through the crucible of challenging assignments. 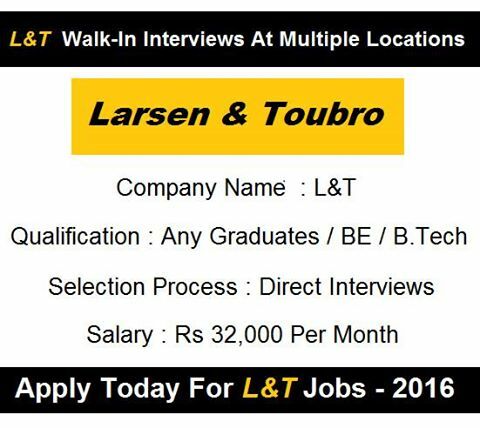 Job roles:L&T visits around 100 campuses where we look for bright engineering talent to partner us in our growth story.